Personalized photo journals make for wonderful holiday gifts! Make sure to order yours by Apple’s December 18th shipping deadline to ensure delivery before December 24th. With iPhoto’s book-creation tools, you can easily combine the best elements of photo albums, written diaries, and scrapbooks to create compelling and personal photo journals. Unlike a regular photo book or album, a photo journal takes your photographs and uses them to tell a story. The images are typically organized chronologically and combined with large amounts of text to create an extensive and coherent narrative. These journals can be a history of a period of time in your life, or they can get creative. You can document all your meals for a month, take a snapshot every day for a year, or create a record of your child’s first months in the world. Select an Album, Event, or handpick the images you want and create a book. You can add more images to the book at any time. If the images you want to use are all part of one event or album, starting a book is as easy as selecting the collection, clicking Create, and selecting Book. If your photos are scattered, switch to the main Photos view and select the images you want by holding down the Command key and clicking thumbnails. Press Command-N to create a new album from the selected shots. Alternatively, you can create the book first and then drag photos into the project. When choosing your images, don’t just use the pretty pictures—look for shots that have a story behind them. You can mix in scans of ticket stubs or other ephemera to give your book a scrapbook feel. If you’ve edited some photos, apply the same adjustments to similar photos when possible to maintain a coherent style throughout. To do this, enter the Edit screen for your first image, select the Adjust tab, and make your changes. Now hold the Control key and click on your image, then select Copy Adjustments. Move to other shots and select Paste Adjustments to apply edits. All the photos you add to a book will be available in the book’s Photos panel as you are designing. You can move images around, zoom in or out on images, or double-click to open one in the image editor at any point during the process. If the Include Text check-box appears in the Design panel, make sure it is checked. Picking the right book theme is key when creating a photo journal. The available page layouts differ with each theme, and you’ll need options that allow for adding a lot of text. We recommend Photo Essay, or one of the Travel themes. (The Journal theme, oddly, doesn’t have many text-heavy options.) Do not change themes after starting a photo journal, because you may lose your text. Once you pick a theme, click create to start editing it. iPhoto will make its best guess about how to flow your selected images, but you can reorder them. Go through and change individual page layouts to get the right balance of photos and text. Click the outline of a page, double click to zoom in, and then click the layout button that appears above it. You can also click the Design button in the bottom right corner of iPhoto to bring up the Design panel and select your layouts there. Choose the number of photos you want on the page from the drop-down menu, and select one of the resulting layout options. If it appears, make sure the Include Text box is checked so that your options include page designs with text elements. Since text is such a key element for a photo journal, you can make a page that’s just a giant text box. Select Text Page at the bottom of the drop-down menu to add these periodic text-only pages throughout the book. When your layouts are set, change the images on a page by dragging new shots in from the Photos panel. To see more fonts, uncheck the Show Selected Fonts box in the Design panel. When you’re ready to add words, decide on a font, text size, and text color for the book. Though selecting text brings up a pop-up menu with a few text features, you should click the Design button for the full list of font options. 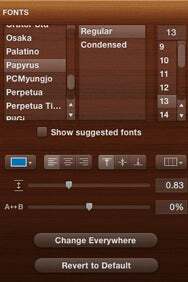 Choose your font attributes from the menus. When you’re satisfied with the look of your text, click the Change Everywhere button to apply the same style to every text box in your book. By default, iPhoto will only list the fonts it recommends for your book template. To see the full list of possible fonts, uncheck the Show Suggested Fonts box. For a more casual and personal feel, look at script fonts such as Bradley Hand and Papyrus. For a professional look, fonts like Georgia and Helvetica will work best for text. Make your book a real page turner by including the story behind a photo instead of just describing what it shows. If your book is chronological, you can begin each block of text with a dateline. Other options might include a location or descripive name for each page, spread, or section. If you do decide on a title, keep the format consistent throught the book. Also, look for layouts that already include a spot for a title, though you can create your own by increasing the font size and making text bold. Add a map to your photo journal and customize its look. Image effects can be added to images to illustrate a story. For example, you could add a sepia effect to one image and then boost the color of the image next to it to suggest before and after. Another great way to make a photo journal engaging is to add a map page from the layout menu. There are seven map styles to choose from, and you can even plot locations to point out where photos were taken. If you have text-only pages but want to make them more interesting, you can make the background an image. Go to either the Background drop-down menu or the menu in the Design pane, and instead of selecting a background color, click on the last square, which shows a gray drawing of a bridge. Whatever image you now drag onto the page will become the background image. You can adjust the exposure of the image so that it doesn’t overwhelm the text on top of it. Another fun design option is to add a Spread layout, which displays one image across two pages. By selecting Include Text, you can even add a small amount of text to the page. When it comes to printing your book, you can’t go wrong with Apple’s printing service, which is geared toward the best results for its own templates. Once you have completed your book, click the Buy Book button to see the details and price for your book. If you are happy, you can then pay and upload your book to Apple’s servers for printing with the finished product delivered to your home or to another recipient. 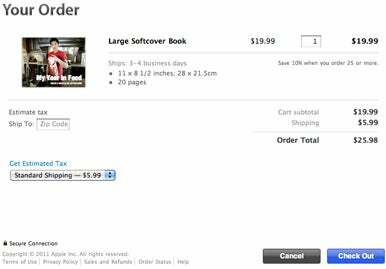 If you prefer to print the book yourself, however, or send it to an alternate service you can export your book layout as a PDF. Go to File -> Print or press Command-P, click the PDF drop down menu and select Save as PDF, and save the file. You are now free to print your book or upload it to any service you like including those we’ve listed below. There are many online book printing services available that will accept a PDF, such as Blurb.com. Most sites will provide a checklist for you to follow to make sure your book prints correctly. You can order in bulk and even sell your book online if you wish. 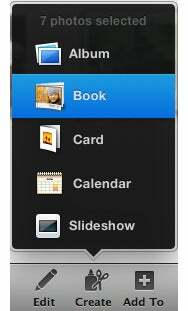 Blurb also offers its own BookSmart software that works with your iPhoto library and allows you to copy photos from iPhoto without affecting the original image. Editor’s Note: This article was first published in April 2011 and is one of our how-to favorites.